In Matthew 14:13-21 Jesus feeds a crowd of five-thousand plus men, women, and children with a meal that begins as a mere five loaves and two fish. That’s pretty impressive…miraculous. How does that happen? That’s an important question and I want to suggest that it has to do with more than just divine power. In the story, the disciples of Jesus wanted to send the crowd home to get their own food when it came to dinner time. Jesus could have easily gone along with their suggestion but Jesus is different. First, when he realized the crowd of people had followed him to the lakeside, Matthew tells us that Jesus had “compassion” on the people which resulted in Jesus healing the sick (v. 14). If we want to see the Kingdom of God at hand in our communities, having compassion for people in need among our community is essential. In fact, we can’t really follow Jesus and live on mission with God if we don’t have compassion for others in need. Compassion is essential and so is faith. I know that might sound a little obvious but when it comes to meeting the needs of others, it’s easy to lose faith. In fact, in my ministry experience, most churches are compassionate people. It’s the faith thing that causes problems. In the story, Jesus orders his disciples to feed the crowd rather than sending them home. However, the disciples are only able to look at what they have — a measly five loaves and two fish — and see Jesus’ instruction as impossible. 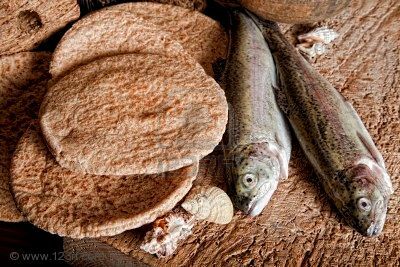 So Jesus tells the disciples to give him the bread and fish and then looks to heaven and giving thanks (v. 19). That’s important because rather than seeing the small portion of food as an impossibility, Jesus has the faith to look at his Heavenly Father as the provider (France, The Gospel of Matthew, 562). It shows the difference between the disciples, who lack faith, and Jesus, who has faith in his Father to provide. It is also a challenge to us. When we encounter the needs of others, will we look at our resources and see limitations or will we look to God, believing that God will provide? When we see the needs of others and act with both the compassion of Jesus and the faith of Jesus, miracles can happen. What exactly those miracles turn out to be might surprise us but we’ll never know without compassion and faith. If we want to live on mission with God, maybe it’s time we follow Jesus outside the box and expect God to do what appears impossible. That’s the making of a miracle. See also yesterday’s post Feeding 5,000: The Unexpected Kingdom of God.